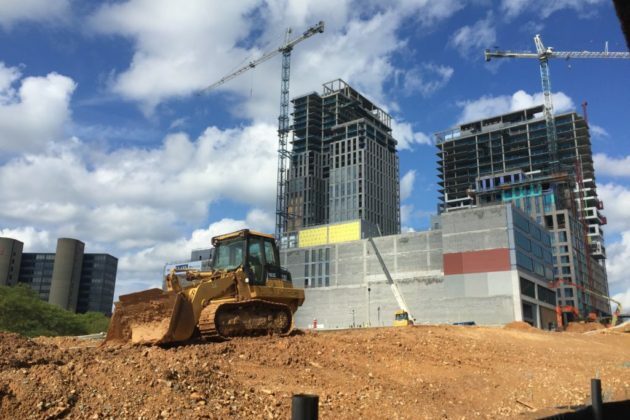 (Updated at 4:30) — The Boro, a mixed-use complex being built near the Greensboro Metro station, has topped out. 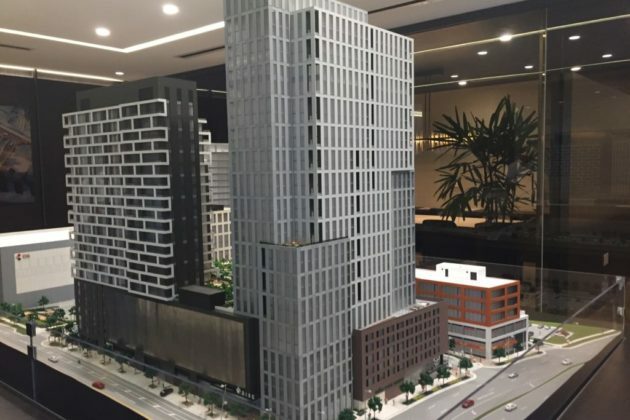 Caroline Flax, senior analyst for site developer The Meridian Group, said the complex is as tall as it’s going to get, so it’s time for a review of the project and where it stands. 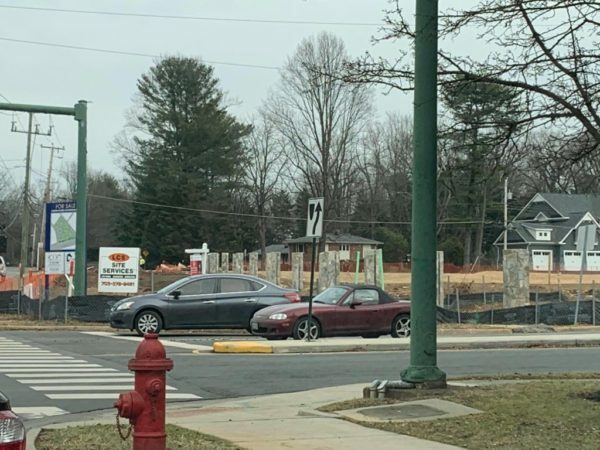 The project is broken into five lettered sections filling the block southeast of the Leesburg Pike and Westpark Drive intersection. 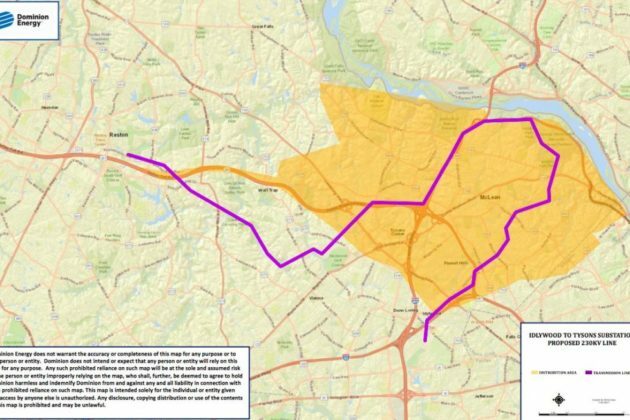 The area is just west of the Tysons Galleria mall. Furthest along is Block C, a grouping of two major buildings and a much smaller kiosk. A third building has been approved for the block but has not begun construction. 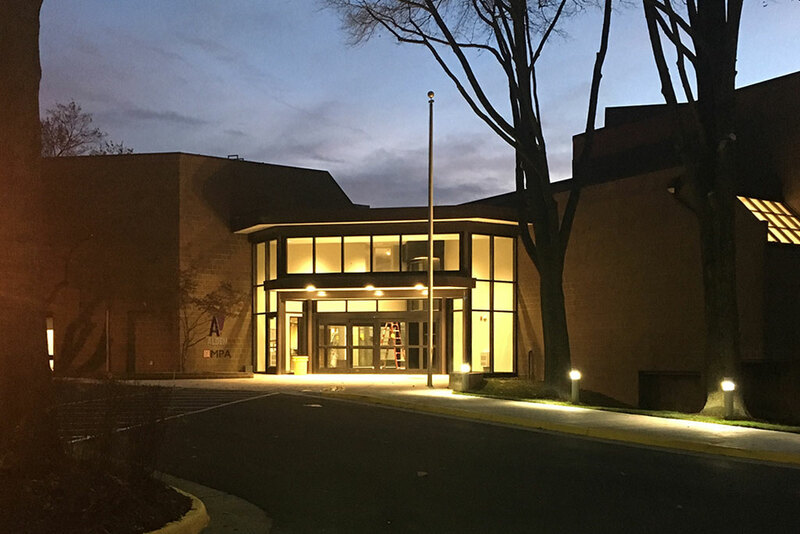 The largest occupants of Block C are the Showplace ICON movie theater and a 437,000 square-foot office building. The kiosk in the one acre park will be where Bluestone Lane, an Australian-inspired coffee chain, will be opening their first Virginia location. Flax said this side of the project is expected to be completed by the end of this year. 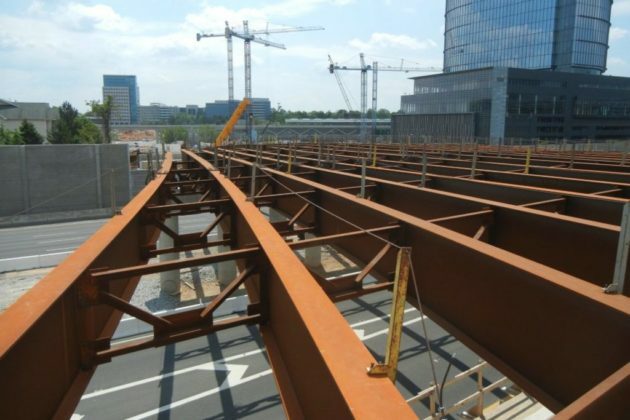 In the first two quarters of 2019, Tysons Reporter was told, the office tenants will begin to move into Block C.
Meanwhile, to the northwest of Block C, the skeleton of Block A has been completed. Block A is the primarily residential area of the complex. 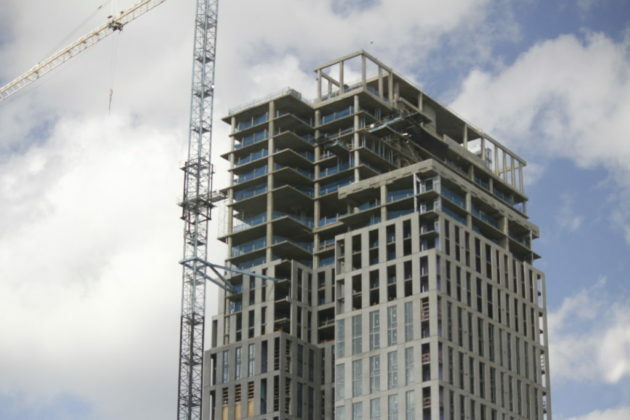 In August, Flax said the tall towers of Block A, the 27-story apartment “Rise” tower and the 25-story luxury condominium “Verse” tower, had all of their floors poured into place. 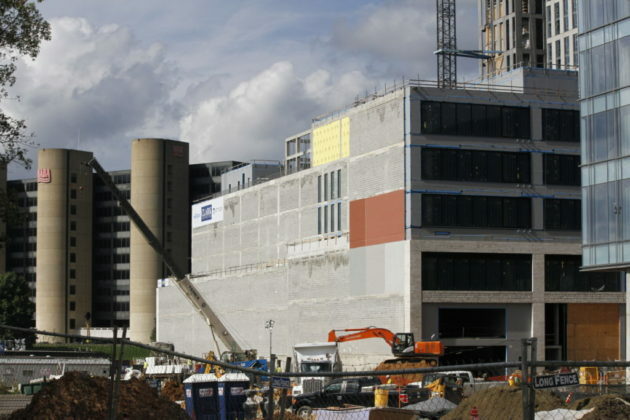 Work is now beginning on the facades and the interior of the buildings. 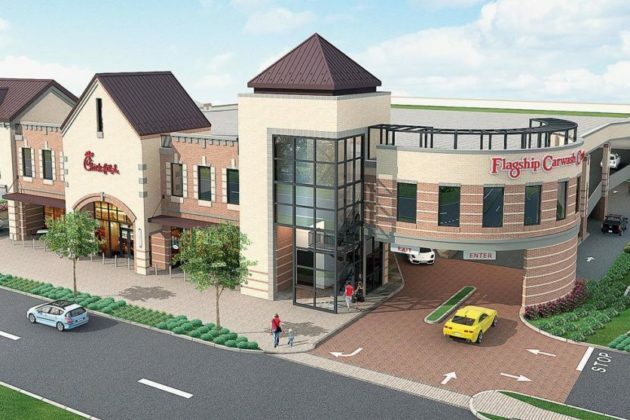 A 69,000 square-foot Whole Foods will occupy the base of the northern point of Block A, at the corner of Greensboro Drive and Westpark Drive. Block B of the project, southwest of Block A, is The Loft. At five-stories tall, The Loft dwarfed by its northern residential neighbors. 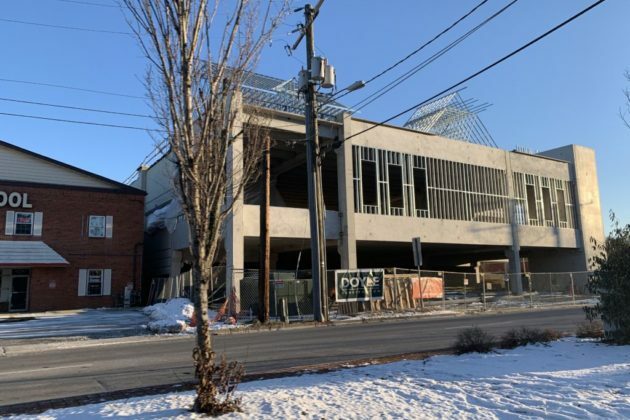 But the 77,000 square-foot building will stretch along the length of the new street Boro Place and hold two floors of retail and three stories of offices above that. 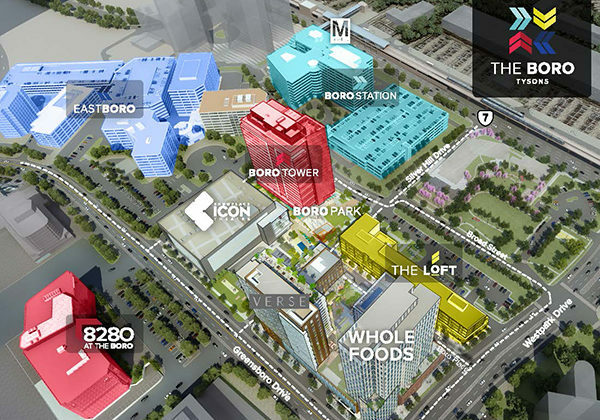 “Boro Place is the retail spine of The Boro,” said Flax. Taylor Gourmet had been signed to move into the area as well, but the chain filed for Chapter 7 bankruptcy at the end of September and closed all locations. Flax said no decision on a new occupant has been finalized but that there are several prospects for the location under consideration. The Jones Branch Connector will soon be open to one lane of traffic in each direction. 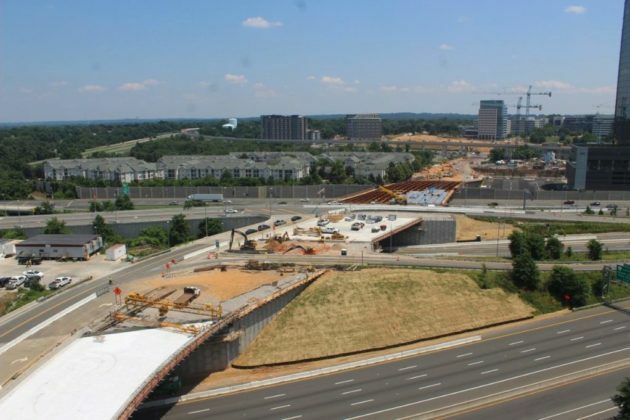 The Connector is a new roadway connecting I-495 Express Lanes and Jones Branch Drive to Scotts Crossing Road, providing an alternative route across the Beltway and linking the eastern and central areas of Tysons. 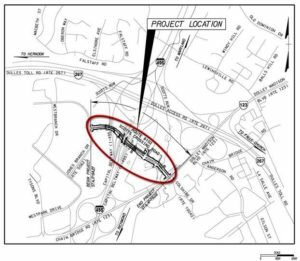 The aim of the project is to relieve traffic on Route 123 and other congested intersections around Tysons. 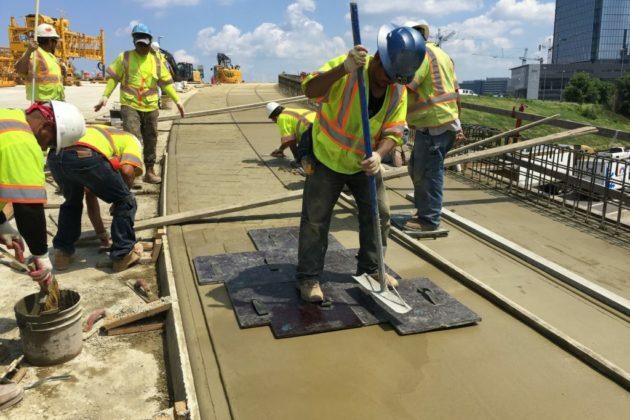 Ellen Kamilakis, a spokeswoman for the Virginia Department of Transportation (VDOT), said the bridge is still on time and on budget for $58 million. 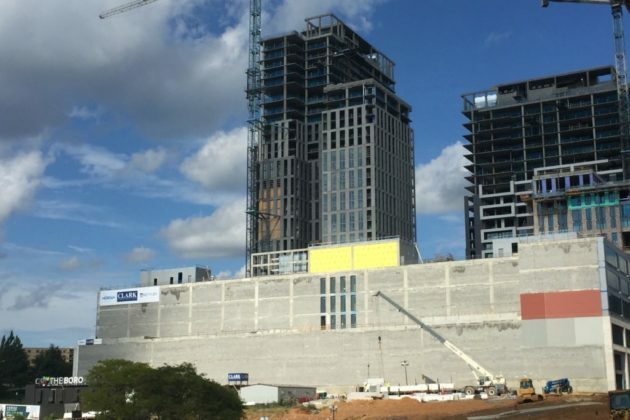 The Connector’s partial opening is scheduled on or before Dec. 12. One lane in each direction on the roadway will be available, as well as one of the multi-use paths on the side of the road. Construction on the project started in January 2017. 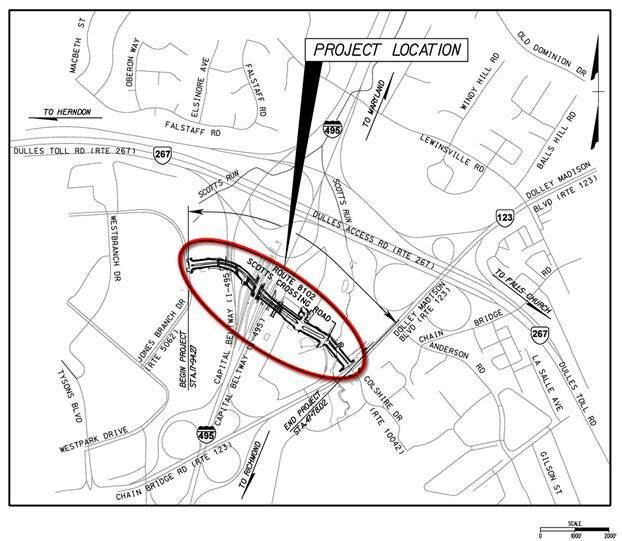 Substantial completion is planned for October 2019, meaning the Connector will be completely operational. Full completion is planned for November 2019. 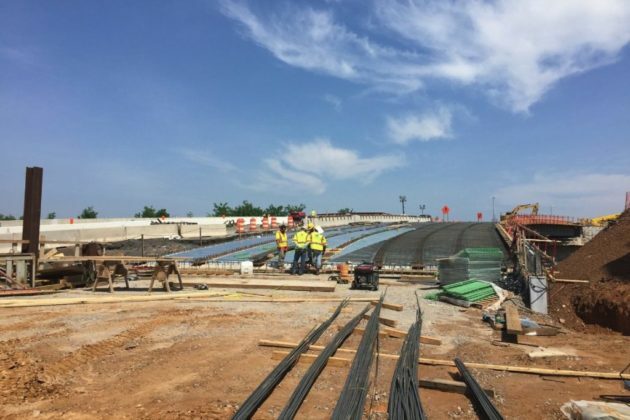 When it’s finished, the Connector will have two travel lanes and on-street bike lanes in each direction. 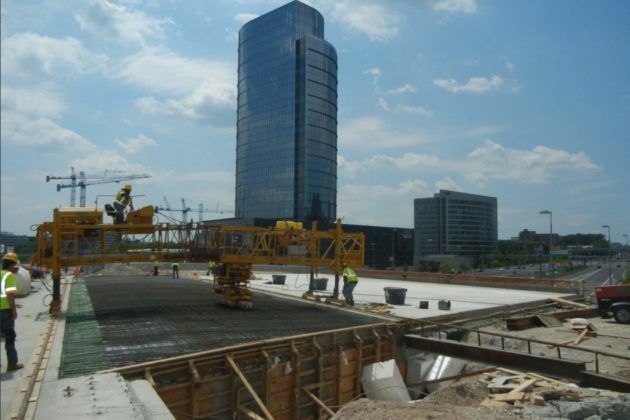 Aiming to help make Tysons more walkable, the project features eight to twelve foot lighted sidewalks. The Connector is expected to carry more than 32,000 vehicles per day by 2040. Kamilakis said the most recent update on the project is that roadway grading is underway, with crews readying to lay down asphalt. 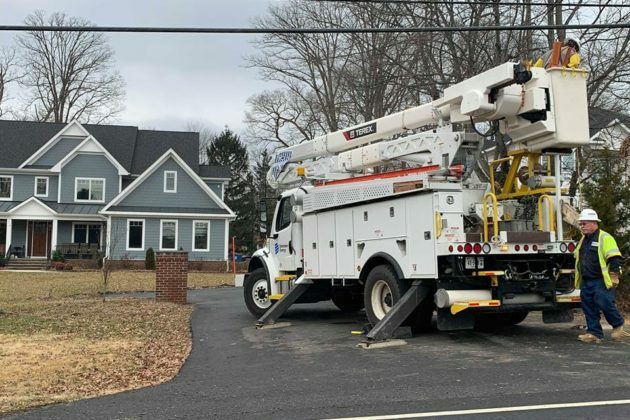 Work is being done concurrently on the storm sewers and utility work. 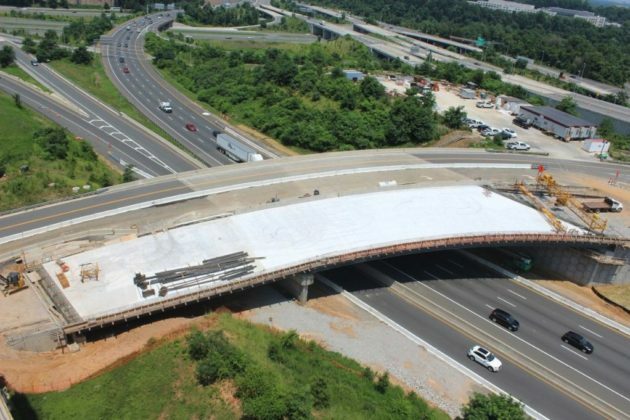 Work is also being done on the project’s three bridges, which will cross over I-495.